Slice prosciutto into rough pieces. Heat a fry pan over medium heat. Add a ½ tsp olive oil. When hot, add prosciutto. Stir for a few seconds, then add garlic. Sauté until prosciutto is just crispy. 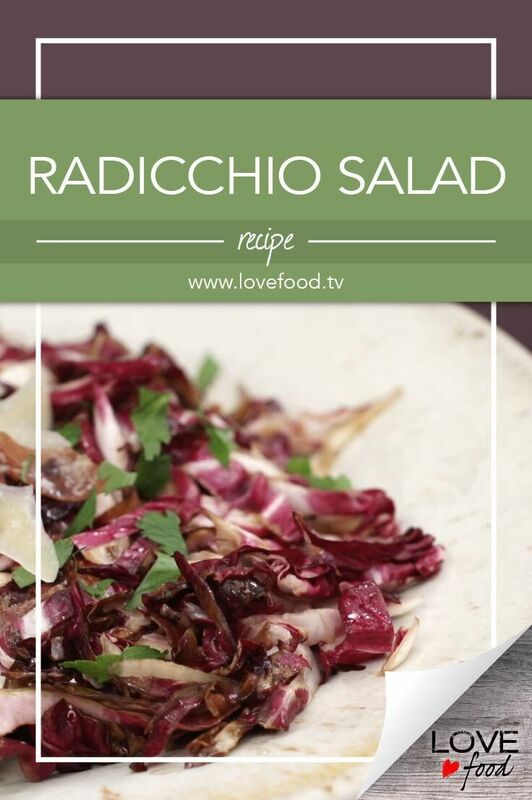 Meanwhile, remove outer leaves from radicchio. Cut head in half and slice into fine slivers. Set aside. Whisk olive oil, balsamic and Dijon together. Season with salt and pepper. Toss radicchio in pan with prosciutto. Add dressing and quickly toss. Divide between serving plates and top with strips of Parmesan – use a vegetable peeler for this job. Finish with a sprinkling of sea salt, pepper and parsley.